At least 30 NREN and university engineers from the UbuntuNet Alliance region will benefit from two training workshops that will be held as part of the preceding events to the UbuntuNet-Connect 2016 conference to be held on 3-4 November, 2016 in Entebbe, Uganda. With assistance from its partners, UbuntuNet Alliance will, during the UbuntuNet-Connect 2016 week, hold a five-day Training-of-Trainers workshop for network engineers as well as three-day DevOps training for Application Engineers. According to UbuntuNet Alliance Technical Manager Joe Kimaili, the Training-of- Trainers workshop, which will be held in partnership with the Network Start-Resource Center (NSRC) and is expected to run from Saturday, October 29, 2016 to Wednesday, November 2, 2016, will target at least 15 network engineers who will be expected to initiate similar trainings in their NRENs. Parallel to this workshop will be the DeVoPs workshop for Application Engineers which UbuntuNet Alliance will hold in partnership with the CSRI and the Sci-GaIA consortium. UbuntuNet Alliance Projects Coordinator Chris Rohrer says the DevOps workshop, which is expected to run from Monday 31st October 2016 to Wednesday 2nd November 2016 will also target 15 engineers from the region. 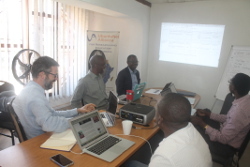 The DevOps training will be a second one for this year after the Alliance also partnered with the MAGIC project to deliver a similar workshop in Dar es Saalam, Tanzania in April this year. UbuntuNet Alliance welcomed Prof Madara Ogot of Kengineer Consulting at its Secretariat in Lilongwe, Malawi in August this year. The University of Nairobi Proffessor was at the Secretariat to lead the conclusion of the reviewing of the Alliance’s Nairobi Rolling Strategic Plan which is set to come to the end of its cycle in 2018 having started its course in 2014. The mid-term review of the plan started on 20-21 June, 2016 in Nairobi, Kenya where Prof Ogot met with the Alliance team comprising the CEO Dr. Pascal Hoba, Finance and Administration Manager Tiwonge Banda, Technical Manager Joe Kinaili and other Trustees to kick start the reviewing process. From Nairobi, the reviewing exercise was completed in Lilongwe with a four-day exercise from 9-12 August 2016. Speaking after the review meeting in Lilongwe, UbuntuNet Alliance CEO Dr. Pascal Hoba said the review was important as it gave the Alliance a chance to look at what it has achieved in the past two years as well as how it intends to achieve its goals in the last phase. “The Nairobi Rolling Strategic Plan was launched in 2014 and is expected to run until 2018. This means that we have implemented the plan for two years and there was a need to review how we have implemented aspects of the plan in the past two years while looking to incorporate some developments that have unfolded on our working terrain since the launch of the plan. With the review we now have a clear idea on where we are coming from as well as know the correct path and tools we need to take and use to achieve the our goals and those of the NRENs we serve,” said Dr. Hoba. The Nairobi Rolling Strategic Plan 2014-2018 is the third plan for the Alliance after the Zomba Strategic Plan 2007-2010 and the Dar es Salaam Rolling Strategic Plan 2009-2013.